Below are the documents, presentations and feedback received during the MARC Rail Communities meetings. Please refer to the main MARC Rail Communities Plan webpage for information on current and upcoming items. October 19, 2017: The team briefed the Planning Board on preliminary recommendations for the MARC Rail Communities Plan. View the staff report and the presentation. October 5, 2017: The team briefed communities members on preliminary recommendations for the plan at a meeting at the Sidney Kramer Upcounty Regional Services Center. 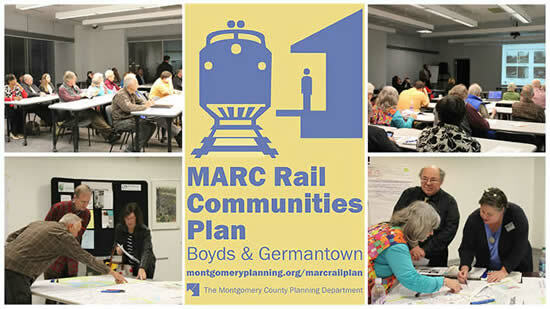 January 19, 2017: The team presented information to the Boyds Civic Association on the CSX underpass replacement study, a conceptual alternative illustration for Ride On’s potential Meet the MARC service from Clarksburg to Boyds, and an exhibit illustrating floor area ratios (FARs) to help residents understand the proposed zoning elements handout for the Boyds portion of the plan. November 30, 2016: The team presented information on the preliminary Boyds MD 117 realignment study and the draft Germantown road diet study and cross sections and solicited feedback. July 14, 2016: The team briefed the Planning Board on the status of the master planning efforts. Read the staff report and view the presentation. This application enables you to help guide the MARC Rail Communities Plan by making comments and suggestions about your area that we will use in developing recommendations for the Plan. During the workshop, 15 Ask the Specialist sessions were held, during which agency representatives gave brief presentations describing what is influencing or will be happening in the vicinity of the two respective MARC station areas. In the evening, community members had the opportunity to participate in a community visioning exercise for the station areas in Boyds and Germantown. 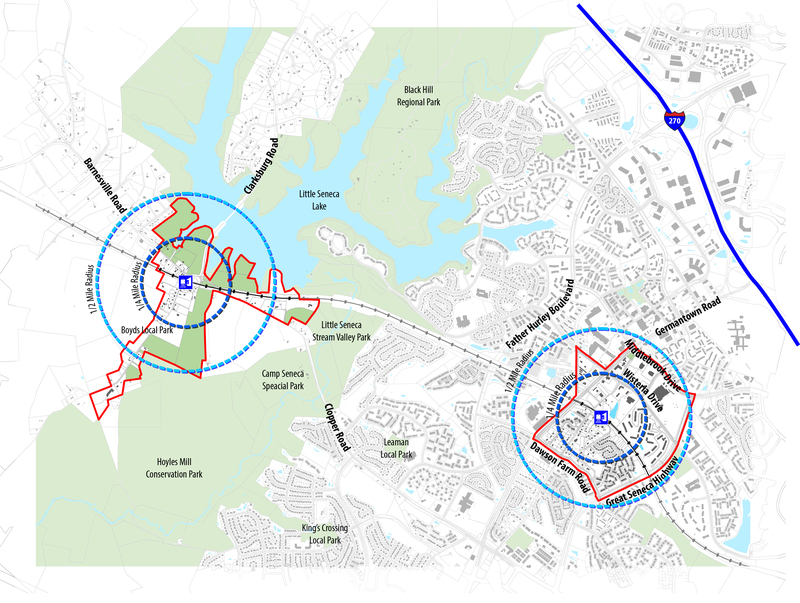 Planners developed a set of proposed goals and planning process diagrams for the future of the Boyds MARC station area based on previous community and agency input. Also, an engineering consultant presented initial sketches investigating the feasibility of a proposed vehicular bypass connecting Clarksburg Road to Clopper Road over the railroad tracks. Community participants had the opportunity to provide comments on these initial ideas. Planners developed a set of proposed goals and planning process diagrams for the future of the Germantown MARC station area based on previous community and agency input. Community had the opportunity to provide comments on these initial ideas. Based on community and agency feedback during sessions held on March 14 and 15, planners refined the planning process diagrams and received comments from the community. 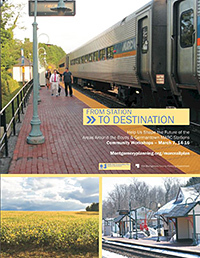 View the Marc Rail Communities Plan Briefing Book. View a brief background document about the plan. 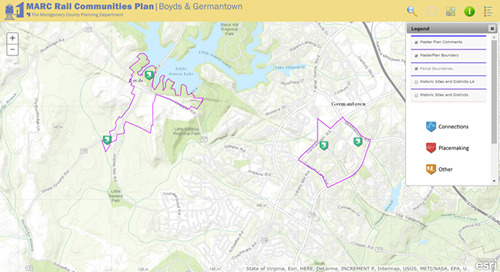 Station 1: What makes the Boyds and/or Germantown areas special? Station 2: What would you like to change? Station 3: How can the MARC rail station areas be a catalyst for that change? Station 4: How do you envision the future of your communities?.